Barnevelders or ‘Barnies’ as they are affectionately known, are relative newcomers to the world of chickens. That hasn’t held them back though, they have a firm following and rightly so. 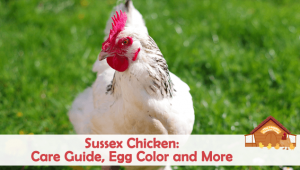 They are a low maintenance hen with a fun personality and good looks! Once the darling of the Dutch egg industry, the Barnevelder now finds favor with many small flock keepers as a dual purpose hen. In this article we are going to discuss the different varieties of Barnevelders, their temperament and of course, their beautiful chocolate colored eggs. Despite being a relatively recent addition to the chicken family, the exact genetic make-up of this lovely bird is a bit murky. The town of Barneveld, east of Utrecht, is home to a large agricultural college specializing in poultry. As such, the area became the hub of the poultry industry in the early twentieth century. The area was known for supplying eggs to Europe and the egg supply market was huge. England wanted brown shelled eggs at that time, so it became necessary to make a bird that laid dark brown eggs so the farmers could keep up with demand. The original birds of the area were likely ‘landrace’ and other older local breeds that had lived in the area for a long time. With the arrival of Oriental birds, the local poultry folk started cross breeding their hens with different imported fowl. Langshans were certainly used in the mix, Malays and Brahmas’ too. In 1898 Gold Laced Wyandottes were added to the mix, but there was still a lot of variety in various Barnevelder lines. A note here to say that different people have some different ideas of the genetic mixture – there is no true consensus of the lineage. As a result efforts were made to bring some form of conformity and the Barneveld Breeders Association was formed. This did much to help with the problem and in 1923 the breed was finally standardized. Barnevelder hens express a beautiful patterning on their feathers; a brown feather with double black lacing to produce an ‘arrowhead’ effect. It is a simple but stunning design I think. The neck feathers are black with no patterning. The genetics to get this effect are quite complex and the rooster does not have this pattern at all. The male is a melanistic black breasted red color and despite many people trying for double lacing on the roosters’ chest it has never happened. The Barnevelder can be described as a rectangular body shape, compact with a U- shaped back. Their wings are high on the body, so the bird does not fly well. Their neck is slightly arched, the tail carried at a perky 50 degrees with a moderate feather spread. Plumage is described as ‘tight’. As for their comb, it is a single variety with 5 points; comb, wattles and ear lobes are red. The eye is red bay in color and the beak is horn colored. Skin and legs are yellow with four toes to each foot. 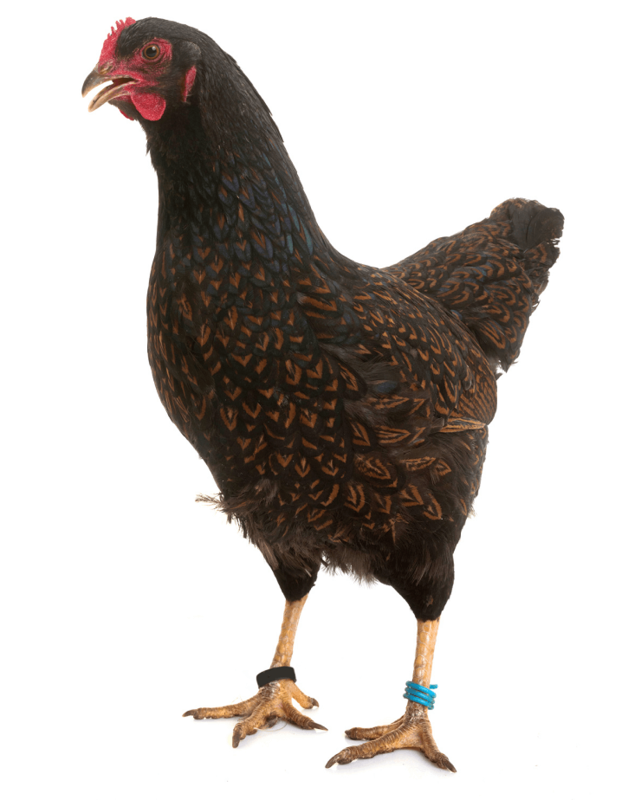 The Barnevelder is a large bird, hens weigh around 5-6lb and roosters weigh in around 7-8lb. 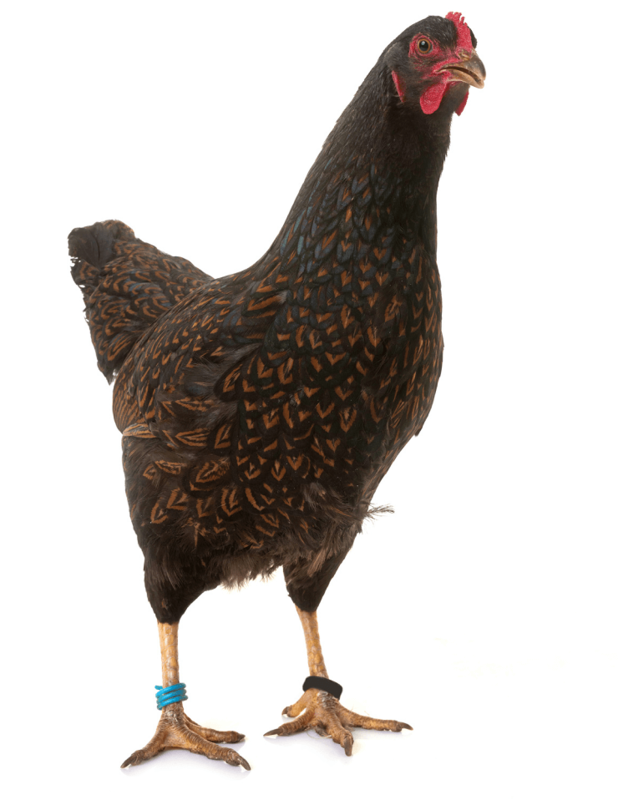 It took a long time to standardize this breed; it was finally accepted to the Poultry Club of Great Britain in 1923. It is classified as a soft feathered, heavy breed. The American Poultry Association recognized the double laced Barnevelder in 1991. They classify it as ‘continental’. The only variety standardized in Holland is the double laced variety. The original colors were partridge and double laced. Sadly, it is believed that the partridge variety may now be extinct. 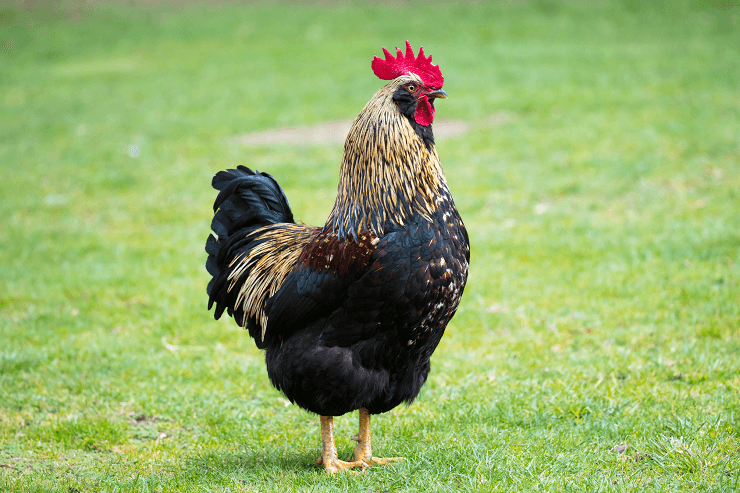 Barnevelders are also available as bantams but they are not easily obtainable from breeders. The bantams are not recognized in the standard. It should be noted that the above colors are not recognized by the APA and also many of the newer colors have ‘bleeding’ problems which can ruin the look of the bird. The Barnevelder will give you 3-4 large brown eggs each week. The eggs are said to be dark chocolate and occasionally speckled. I have never seen ‘chocolate’ colored eggs from mine, but the eggs are a dark brown with very occasional speckles. They will lay through the winter so this makes them quite popular with some folks. The hens are not known for being particularly broody. Over the years of development, the color quality of the egg has suffered. Time and effort has been put into the plumage but the egg coloring has diminished from a chocolate color to the more common dark or even light brown seen today. As with other breeds, those that are made to produce more eggs will have lighter colored eggs; Marans for example. Barneys are a very easygoing bird and they rarely squabble with anyone; even the roosters are known to be calm. The Barnevelder is a very friendly bird. They are always pleased to see you and will greet you with low key chattiness. They do talk quite a bit, but their voice is low and quiet unlike Rhode Island Reds who like to shout! Barnevelders are active birds they love to free range and excel at it. They can be easily tamed to be pets if you start at an early age and since they are docile, gentle and they are definitely kid friendly. In general, Barnevelders are robust birds with minimal health issues. They tolerate a wide variety of climates and take it all in their stride. They don’t enjoy hot and humid so much, but if they have shade and water available, will do quite well. Allegedly they are highly prone to Marek’s Disease and should therefore be vaccinated at birth. Other than the usual suspects (lice, mites etc. ), the Barnevelder is pretty much problem free health wise. 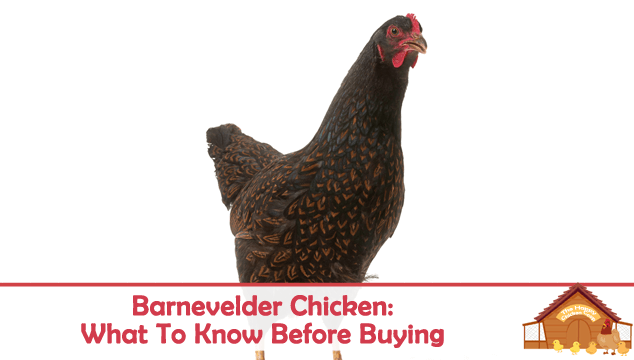 Is the Barnevelder Chicken Right for You? The Barnevelder is a delightfully gentle and inquisitive bird, eminently suitable for a family flock. They will tolerate confinement well, but really enjoy free ranging for goodies. They are very friendly and love to help you with garden tasks such as weeding! Mine are always the first of the flock to run and greet me when I appear in the yard. They are great with kids and if you start them very young you can make ‘pets’ out of them; the chickens not the kids! It would be hard to find a more even tempered bird; I have never seen mine be objectionable to another hen. They are full of life and rarely have a down day. Their attitude is infectious and you will find them lifting your spirits with their happiness. As show birds they do well since their demeanor is unflappable and they are tolerant of a wide variety of conditions. They also do well as 4H or farm project birds for the younger farmers. Barneys are delightful birds – they always greet you and make you feel loved. They are a great addition to any flock although can be picked on by more assertive breeds. They are a good dual purpose hen, non-aggressive and they usually get along with everyone. Some sources list them as ‘rare’ however I would disagree and say that the double laced birds are uncommon but not rare. In fact, the double laced Barnevelder is enjoying a resurgence of popularity currently! Great story about those birds. I already have seven chickens and their buff orpingtons but they sound very similar in personality that’s why I picked buff orpingtons. 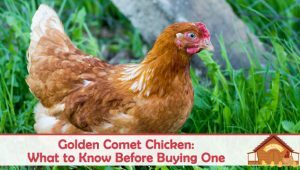 I have never heard of barnevelder chickens before this article. I got some chicks and they’re just 4 months old now. Really nice, pretty birds … I enjoy birds that are laid back enough to be considered ‘pets’. a great read ! Thanks ! This is a very good story about these birds. I have got two them. And are doing well. I don’t get dark egg like you talk about. But I will keep a eye on this. Thanks for the info. I recently got 3 Barnie pullets and they are an utter delight!! They are becoming tame very quickly, are chilled out, confident and happy birds as well as beautiful. Really looking forward to watching them develop and sharing our front garden with them! I have a young barnevelder rooster, and he is not very nice to strangers. He attacks my landlady – who hasn’t done anything to him. But he had a mongoose on its back last week after it tried to attack his ladies…so I love him! We love our pet and so do the neighbors. She is free range and loves it. She sleeps in a tree at night. Her best friend is a neighbors dog. She has not laid an egg yet. She is five months old, so we are on the lookout for her first egg. My Barnevelders started laying yesterday. So exciting to see the brown speckled egg. They do take longer to lay than some other breeds. Similar in temperament to Buff Orpintons. So far, I’m very happy with these Barnevelders. Superb Article on Barnvelders. I have a tiny flock of pullets and look forward at trying to develop some darker eggs. Thanks for sharing.